I love your blog and I have read it for several years. My question: If I do not wear sunscreen when I am inside, will I get more wrinkles then? The short answer is that you definitely need sun protection indoors — though whether or not you need sunscreen depends on where you are. Windows and fluorescent bulbs can let through UV rays that can cause damage to your skin — so unless you’re in a windowless room with no light, your skin is receiving UV radiation. You can protect your house so that you can walk around without sunscreen, but if you haven’t taken those measures or you’re in any other building, you should slather on sunscreen. UVB — These rays are like long nails that can quickly puncture your tired and ruin your ride, Yarosh explains. UVB rays are the most problematic and cause tanning, wrinkles, free radicals, DNA damage, and cancer. UVA — These rays are like small nails that cause minimal damage that can build up over time, Yarosh explains. UVA rays are less problematic than UVB rays in the short-term, but they are longer than UVB rays, which is a problem long-term. Not protecting yourself from them still causes tanning, wrinkles, free radicals, DNA damage, and cancer. According to the American Cancer Society and the Skin Care Foundation, window glass in buildings and cars only protects from UVB rays, letting in 62.8% of UVA rays that can damage your skin. You’re not safe with tinting either, as ordinary tinting only blocks 3.8% of UV rays (sunaware.org). Fluorescent lighting can also produce small amounts of UV rays that can be damaging over time (GELighting). 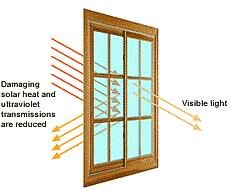 In your own home, you can use window films to block up to 99.9% of UV rays that would otherwise do damage to your skin over time (Skin Care Foundation). This film has been found to be highly effective in blocking rays (PubMed). You can also have your windows and cars professionally tinted — while regular tint only blocks 3.8% of UVA rays, gray tinting will block 99.1% of UV rays. Just make sure to get your car professionally done to comply with state laws about window tinting (sunaware.org). However, if you don’t have window films or special window tinting, you should be wearing sunscreen indoors to protect yourself against the cumulative sun damage. And don’t just look at SPF; make sure your sunscreen includes zinc oxide to protect yourself against those UVA rays. For even more protection in- and out-of-doors, you can use Cina Tibasorb FD in the laundry to make your clothes more protective against UV rays. This can be found in Rit Sun Guard Laundry Treatment UV Protectant ($19.98, Amazon.com). Whether you can see the immediate effects or not, windows and even fluorescent lights can lead to skin damage over time. This means that you need to protect yourself, whether that’s by putting films on or tinting your windows or by wearing sunscreen all the time. You can also make your clothes more protective by washing them with a laundry treatment containing Cina Tibasorb FD. Of course, you also have to make sure that you are getting enough sun in order to ensure you do not have a vitamin D deficiency! The American Academy of Dermatology believes you need 15 minutes of sunscreen-free exposure each week. If you are unsure or are living in a cooler climate, take a vitamin D supplement.